Creme Egg lovers rejoice! 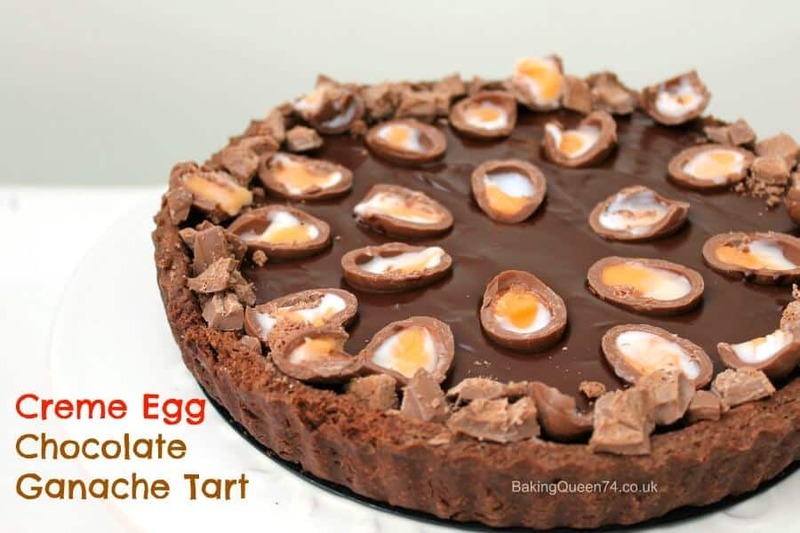 Try my Creme Egg Chocolate Ganache Tart this Easter for a rich chocolatey treat! 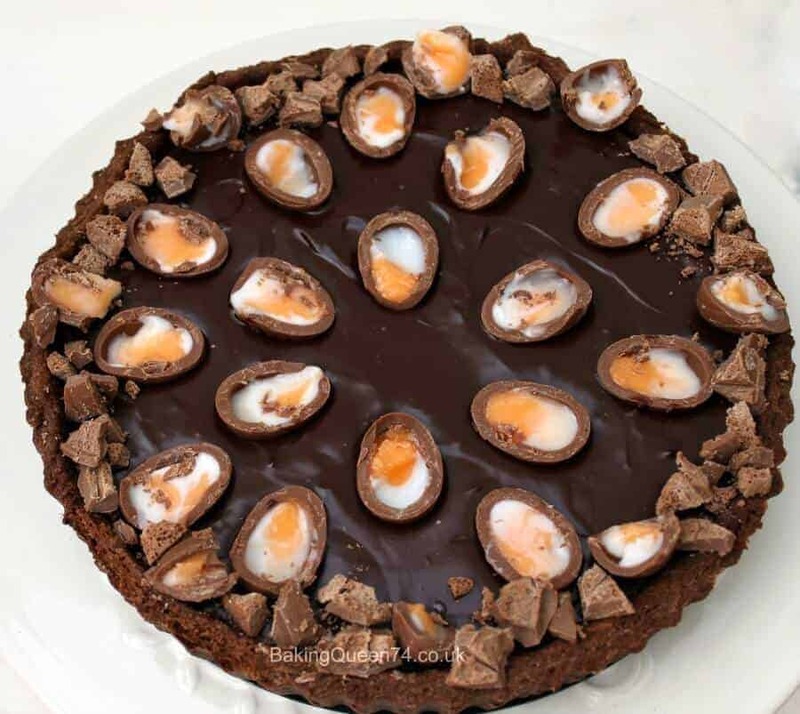 As you can see I’ve been getting busy baking up a delicious Easter chocolate tart for you to enjoy this April! If it’s Easter, there have to be Cadbury’s Creme Eggs of course. It’s the law. They may have changed the way they make them but they still mean Easter, at least for chocolate lovers. What better than to add creme eggs to a delicious chocolate ganache tart with chocolate pastry. True chocolate overload! Definitely not one for you if you’re dieting, but for a treat for the family at Easter, why not. We bravely ate this tart before Easter just to try it out. I’ll definitely have to make it again if the happy faces at the table were anything to go by. I’m going to have to get back in the gym after eating this, but it was definitely worth it! 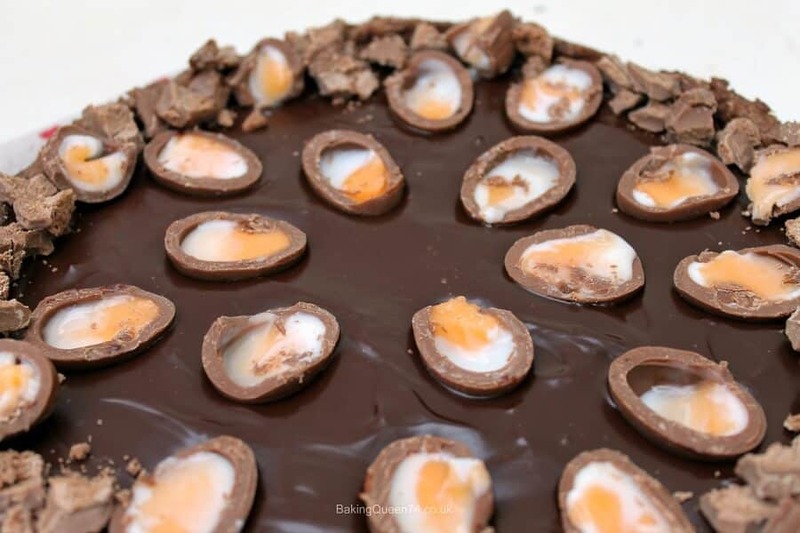 A rich and indulgent Creme Egg dessert perfect for Easter! Sift the flour, cocoa powder and caster sugar into a bowl. Rub in the butter until it looks like fine breadcrumbs. Beat the egg yolk with the cold water then pour it into a well in the middle of the flour mixture. Use a spoon to mix it together and then press together with your hands. Cover with clingfilm and put it in the fridge for half an hour to chill. Remove from the fridge and roll out carefully so it is larger than your tart tin. Drape over the tin and push the corners gently into place. Press the pastry round the tin so the edges become fluted. Trim off the edges with a sharp knife, to the shape of the tin. Place your tin on a baking sheet to make it easier to handle. Then put the tin (still on the sheet) back into the fridge to chill for another half an hour. Meanwhile preheat the oven to 180 degrees. Remove the pastry shell from the fridge. Prick the base with a fork to stop it rising as it bake and to allow the steam to escape. Fill the pastry shell with baking beans (I use dried pasta, you can also use dried rice) on top of baking paper and bake for 10 minutes. Then remove the baking beans and baking paper and bake for a further 10 minutes for the base to become crisp. Leave the case to cool. Bring the double cream and light brown sugar to a simmer in a small pan, then remove it from the heat. Place the broken up chocolate in a large bowl, then pour the cream over the chocolate. After a few minutes stir the cream and chocolate together until it is smooth and a uniform colour. Pour the ganache into the pastry case and smooth the top with the back of a spoon. Split one pack of the mini creme eggs in half with a sharp knife. Arrange them on top of the ganache and press them in slightly. Put the tart back in the fridge to set. 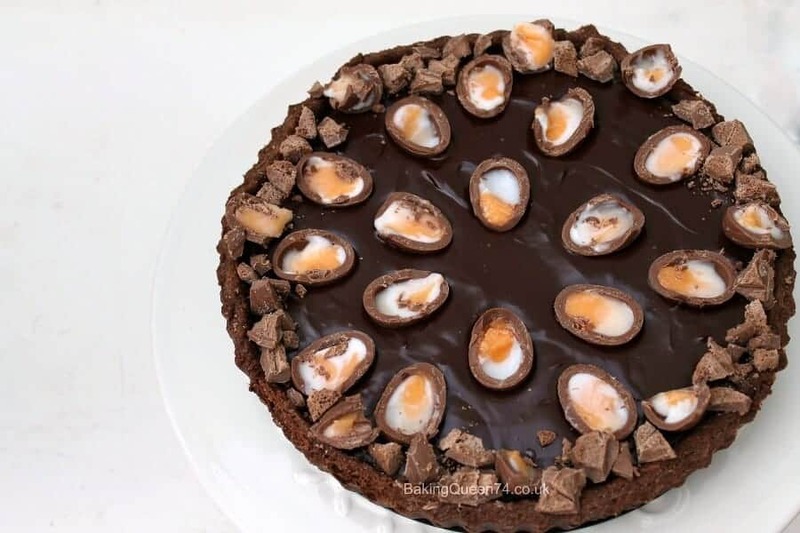 Once it has set - this should take 1-2 hours but depends on your fridge - cut three or four more of the mini creme eggs into quarters, and arrange these around the edges of the tart. Cut the Galaxy Bubbles egg into small pieces and crumble it between the quartered mini creme eggs. Serve for a delicious extravagant Easter dessert! Also linking up with the new Pastry Challenge linkup from Jen from Jen’s Food and Lisa from United Cakedom. Linking too with Supergolden Bakes and #CookBlogShare. Thank you Sammie! Definitely a good one for the Easter lunch. Going to have to make another here! This looks and sounds ridiculously good!! Thanks Lindsay, it is toooo good! Thanks Jo, very rich and yummy! Looks amazing, perfect chocolate indulgence for Easter. Sadly I’m one of those weird people who doesn’t like creme eggs but I’d just eat round them and let the OH finish off my slice! My cup of tea is looking rather lonely without a slice of this tart. 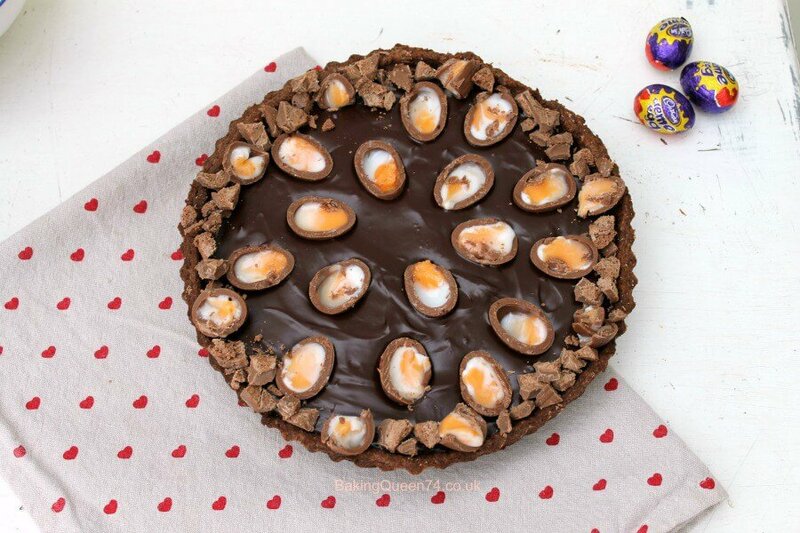 Wowzers, this is a chocoholics dream Lucy – or perhaps I should say my dream tart. Thanks for sharing one of my Easter recipes too. I am about to go into a chocolate coma I think after eating some. Glad you like it and happy to share the link love! Thanks Camilla! Yes, not something I’ve attempted before, love Creme egg brownies too. I really think we’re providing a valuable public service!